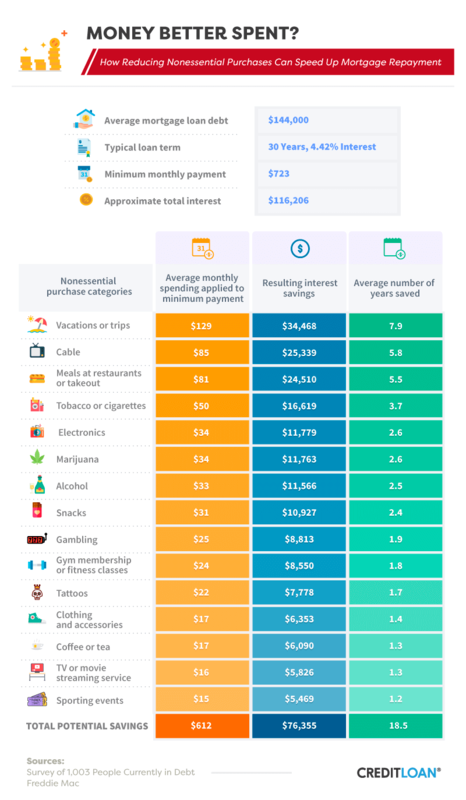 How do people in debt spend their money? And what caused them to fall into debt in the first place? The answers to our survey might surprise you. The human need for instant gratification, driven by exponential growth in technology, is rapidly changing the way we live our lives, arguably for the better. Our need to have things "now" has driven us to create massive digital platforms like Facebook or Twitter to instantly reach millions with our messages and products, as well as app-based services like Uber, which enable us to get the "stuff" we want to be delivered faster than ever before – all at a price. Many of our modern conveniences (and most of our vices) cost money. All these seemingly inconsequential charges, like $10 Uber rides, $13 Netflix subscriptions, and $5 app store purchases add up quickly. And when lumped on top of the already rising cost of living, debt can pile up unexpectedly. And pile up it has. Although the current U.S. debt-to-income ratio is less than it was around the peak of the 2006 housing bubble, household debts still add up to about 90% of people's annual income. But what does that mean exactly? Is our modern lifestyle pushing us into debt faster than we realize? Or are we getting better? Do we even care? To learn how to deal with debt and emerge from it, we surveyed more than 1,000 people currently indebted to get answers to these questions and more. We found the need for instant gratification, generational differences, personal habits, and how we pay our bills all impact just how much debt we carry, how we pay it, and for how long. It might be safe to say most of us want to look and feel good now, so many of us live for the moment. Loans and credit card debt are as American as apple pie, and debt's stigma isn't what it once was. So what's wrong with valuing short-term enjoyment over long-term financial security? Maybe the compromise is lowering your level of enjoyment, but using a few smart tactics to ensure you don't get too far behind the debt eight ball. Student loan debt is almost standard these days, with about 70% of students graduating with major debt. These large loans can stretch out a decade or more and, even though the interest rates are relatively low on both, the amount of interest paid over the life of the loan can be staggering. By simply adjusting (or removing) one or more common expenditures and applying these savings to the loan, you can shave years off your payoff date and potentially save thousands of dollars over time. The longer the loan duration and higher the interest rate, the more you can potentially pocket in interest and payments by applying a few simple tactics. The two examples provided, one for a typical student loan and the other for a typical mortgage, demonstrate just how much you can save by adjusting your lifestyle. Cutting the cable cord could save you more than $2,000 in interest and nearly two and a half years of student loan payments, while quitting smoking (or other tobacco use), aside from the obvious health benefits, might save you close to $1,400 and one and a half years on your loan. When you apply the savings to a bigger loan with a longer amortization (mortgages are typically 15 or 30 years in duration), the total savings from smart budgeting can get even larger. If, over the life of the mortgage shown (which was the average amount held by our respondents), the typical person stopped smoking cigarettes and marijuana as well as gambling and used that money to pay additional principal on the loan, they might shave more than eight years off the total loan period and save more than $37,000 over the life of that loan. Cutting cable and alcohol consumption could save you nearly $37,000 over the life of the loan. And if none of these items apply to you, it might be helpful to take an inventory of things you spend money on and see if there's anything you can do without. Even seemingly inconsequential expenses (like those $10 Uber rides) can add up over time. If you don't "need" to spend that money, consider putting it toward your expenses, as the future rewards can be exponential. We also examined what people do with the income they didn't expect (or budget for). From time to time, we may find a little extra cash in our pockets. Be it from a rebate, garage sale, extra job, or otherwise, what you do with unexpected fiscal windfalls may vary depending on your age and just how much debt you have. When it came to generational differences, baby boomers were the most likely to put extra money toward their debts (54.3%). 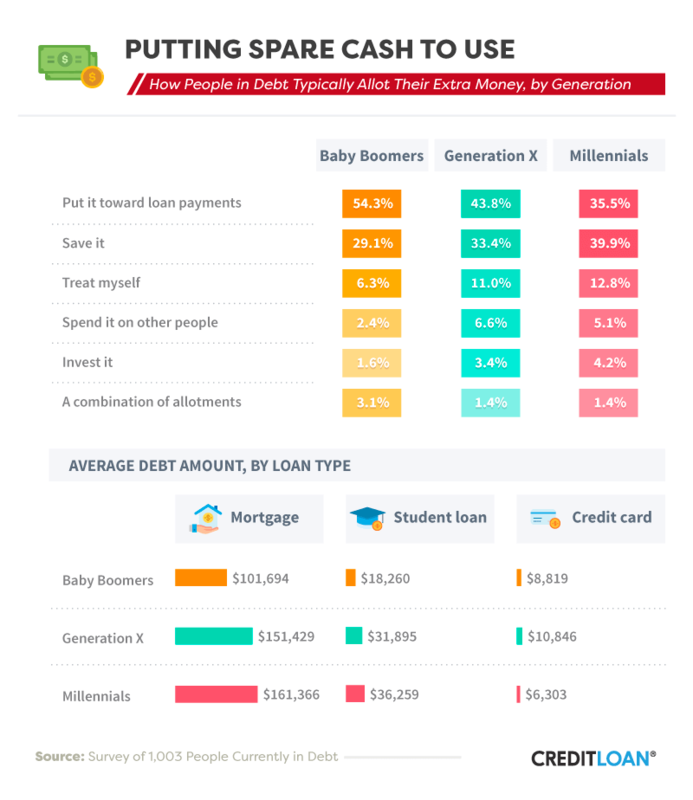 Millennials, on the other hand, were the least likely (35.5%) to put their extra cash toward existing loans – but they were more likely than other generations to put their extra cash into savings. The youngest generation surveyed was also the most likely to treat themselves, with 12.8% of respondents spending their surpluses. Gen Xers were the most likely to spend their found cash on others, but only 6.6% of those surveyed were willing to do so. While the debt loads of the respective generations aligned with logic, it was interesting that millennials – the generation supposedly living with parents or renting – had the highest mortgage debt at $161,366. It was also a bit odd that millennials had the least amount of credit card debt, nearly 42% less than Gen Xers, who topped the list. If you find yourself in debt (and whether you're stressed about it), there is a multitude of ways to get out of it – or at least reduce your monthly payments. 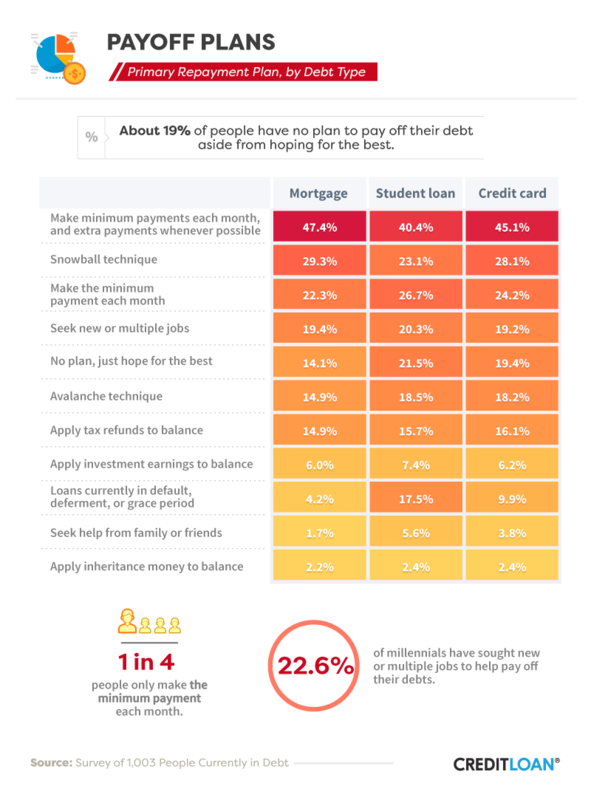 Our survey examined the top payoff plans and the corresponding debt loads for people who favored those plans. The most popular method for paying all loans was one of the simplest: making minimum payments each month, then paying additional amounts whenever possible. Almost half of the mortgages were paid this way, with credit cards close behind. 40.4% of student loan borrowers also utilized this method. Taking a more calculated approach to debt reduction, people utilized the snowball technique as the second most popular method, with nearly 30% of mortgage borrowers, roughly 23% of student loan borrowers, and about 28% of credit card consumers using it. The snowball method focuses first on the smallest balances by making the minimum payments on all accounts, then using any remaining cash to pay down the smallest debt owed. Once that debt is paid, you move to the next largest and repeat. Similar to the snowball method is the avalanche method, in which consumers focus first on paying down debt with the largest interest rate, then moving on to the next. Avalanching wasn't as popular (15.9% overall), as it seems consumers were more focused on getting big balances paid off, rather than interest rates. While both the avalanche and snowball methods are effective systems of repayment according to industry experts, each has unique pros and cons you should research before applying either. Roughly a quarter of respondents would only pay the lowest payment per month on their loans – which is not the most efficient way to reduce large loan balances. Surprisingly, about 19% used "hope" as their sole strategy for debt reduction, stating they had no real plan for repayment aside from hoping for the best. According to our survey results, these folks carried an average debt load of $95,974, including mortgage, student loan, credit card and other debts. Our survey also revealed 22.6% of millennials, the generation starting the "gig economy," were willing to seek extra work or start a new job to tackle their debt issues. Our survey found the size and type of debt can have a major impact on how people pay it back. Those laden with the biggest mortgage balances looked for more or new work to pay off their debts faster. Since nonpayment on a mortgage could mean losing your house, it makes sense that consumers put a priority on increasing their income, rather than just a repayment method. The snowball and avalanche repayment methods were also used by people with the highest mortgage debt, around $159,000 and $151,000 respectively. Tax refunds and investment earnings were also popular with consumer mortgages near the $146,000 mark. Student loan payments were prioritized a bit differently. The avalanche method was popular with high-dollar student loans around $42,000. Those hoping to use a new job (or multiple jobs) to tackle student loan debt had an average balance of $39,148. Credit card debt was addressed in a completely different way than the other two. According to the data, those with the highest debt might not have been able to handle the higher interest rate debt on their own. People with very high credit card balances (averaging over $17,400) often turned to their family and friends for help. Those with over $10,000 in credit card debt were willing to apply their inheritance money to balances, while people making the minimum payment on their credit cards each month had an average debt of $9,790 (and likely growing). Life is meant to be lived. Although each one of us has a unique idea about what "living" means, we should all be cognizant of our financial needs now and for the future. Whatever you spend your money on, whatever your priorities may be, and how much debt you choose to take on, it's not a bad idea to plan for how you're going to pay for it. Carrying debt isn't necessarily a bad thing, as long as you're not strangled by it or stressed from it. Using the right credit card or loan for your needs can also help. If bills pile up, you can always adjust your lifestyle to help pay down those debts or restructure your debts by consolidating or even finding a less expensive place to live. And when it comes to balancing the things you want with smart financial planning for the future, one of our female respondents from New York may have good advice. She said, "I just try to find a middle ground. I know I need to pay off debt, but I also know you only live once, and life is short. You still need to have fun." We collected 1,003 survey results from people who are currently in credit card, mortgage, student loan, auto loan, personal loan, medical loan, or other types of debt. The average amount of debt our participants had was $87,374. 949 respondents were included in visualizations that compared student loan, mortgage, and credit card debt. 53.9% of respondents were female, while 45.8% were male. Less than 1% of people were nonbinary. Respondents ranged in age from 18 to 82, with a mean of 37.5 and a standard deviation of 11.9. In "Speeding Up the Payoff," we estimated payoff times, interest rates, and minimum monthly payments using rounded average mortgage ($144,000) and student loan debt ($34,000) amounts from our participants. All values are approximate, and some were rounded up. The 4.42% mortgage interest rate was based on average 30-year mortgage rates from the past 12 months as of April 2018 from Freddie Mac. The student loan interest rate was based on the current 4.45% rate for federal undergraduate loans from the U.S. Department of Education. We estimated a monthly payment based on the standard 10-year student loan term. 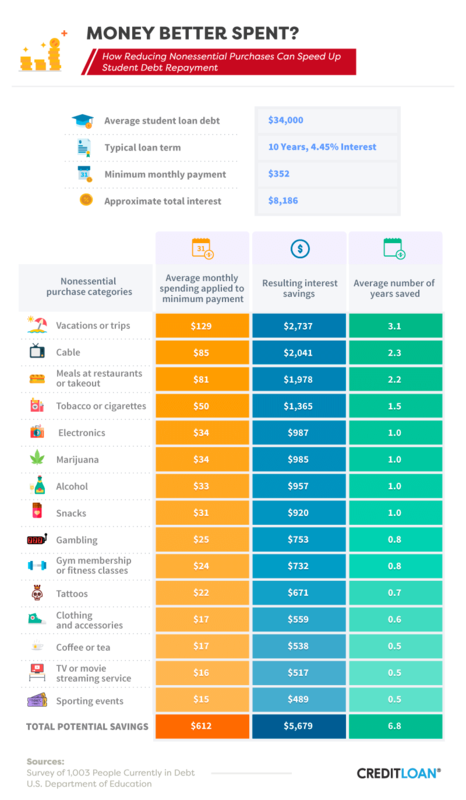 To determine the average amount participants spent on different types of purchases each month, we divided the average annual amounts our respondents reported spending by 12. Responses of "other" were not included in the visualizations, and accounted for 2-3% of responses. If you find this information valuable or interesting, feel free to share with your readers for any noncommercial purposes. All we ask is that you attribute CreditLoan and link back to this page for recognition. If you wish to use any copyrighted material from this page or site for purposes beyond "fair use," you must obtain express permission from CreditLoan.com.